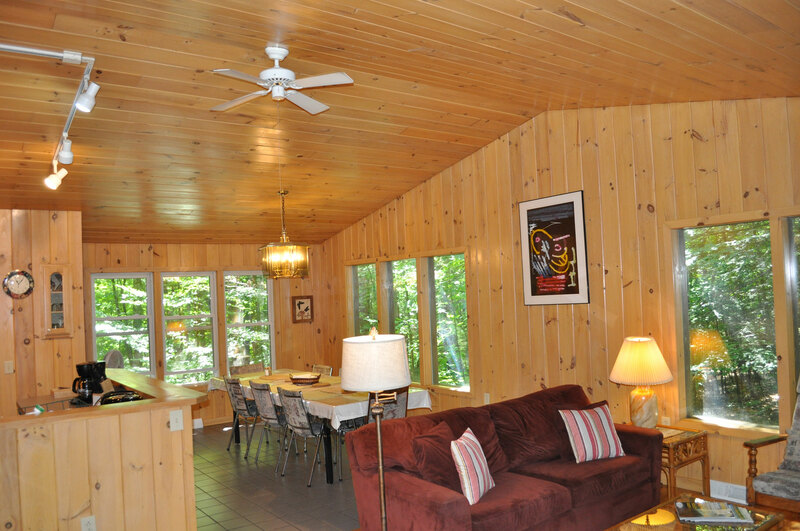 Woodland House at Lake George is truly a dream of a house, situated on 49 wooded acres, for one group at a time. 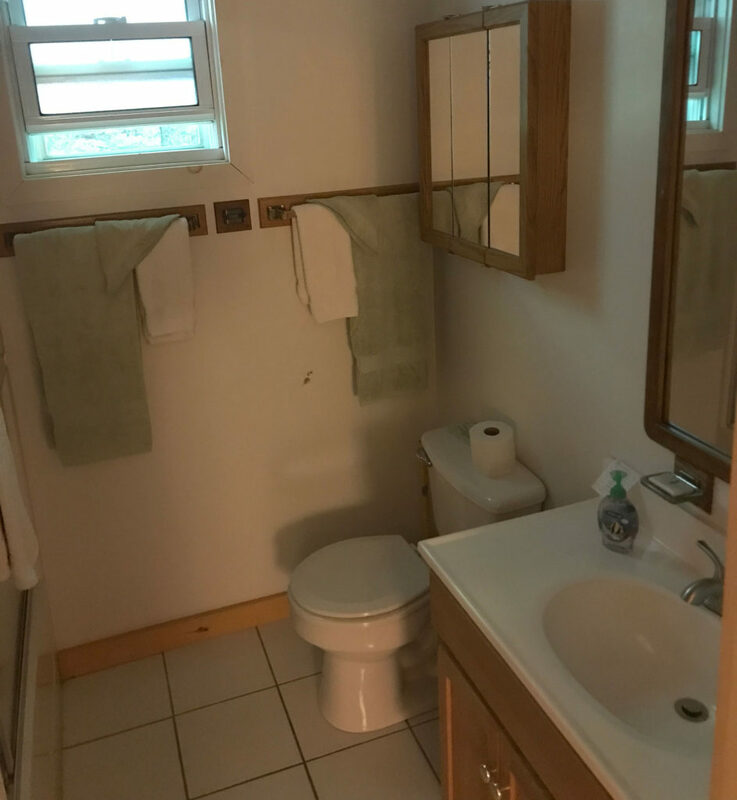 With four spacious bedrooms and four full baths, it sleeps ten comfortably. 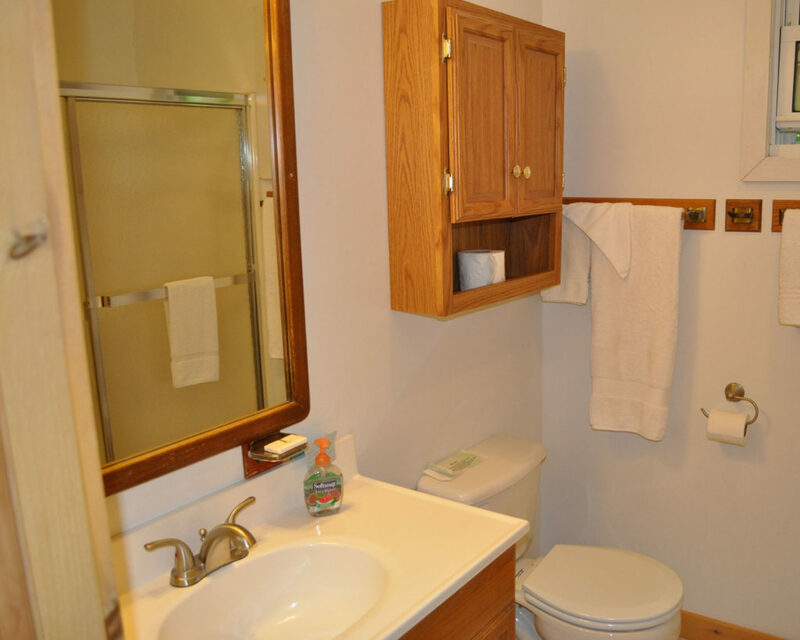 Everyone loves its bright woodwork interior, the well-equipped kitchen, and especially its total privacy. For fun there are a standard size Ping-Pong table and the stakes and the horseshoes for a game of horseshoes. The private hiking trail out back guides you to fine views of the lake. 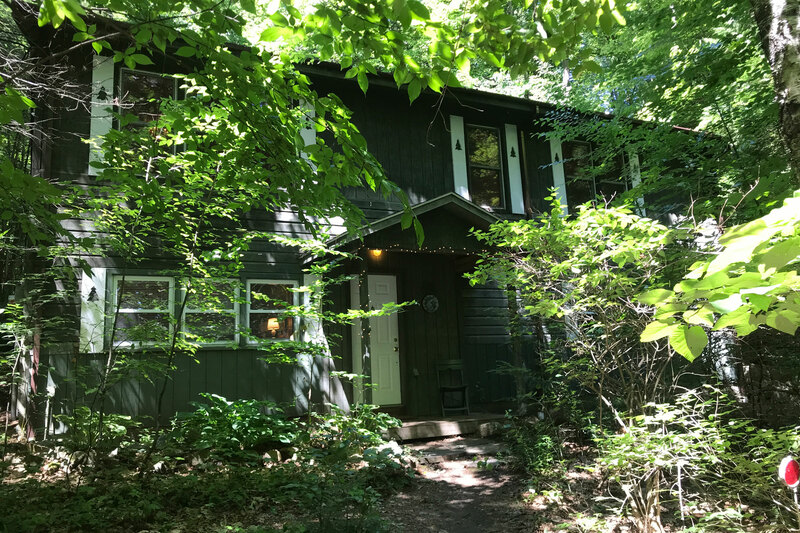 Open year round, Woodland House (formerly called Lake George House) welcomes pets and provides reliable Internet service. 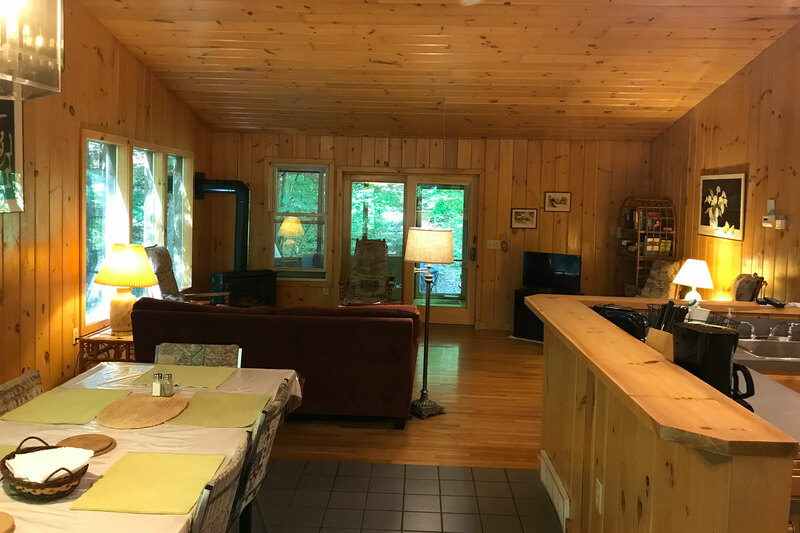 Location Situated 6 miles north of Lake George Village, 4 miles south of Bolton Landing, Woodland House is the only house on a 49-acre parcel of wooded land. 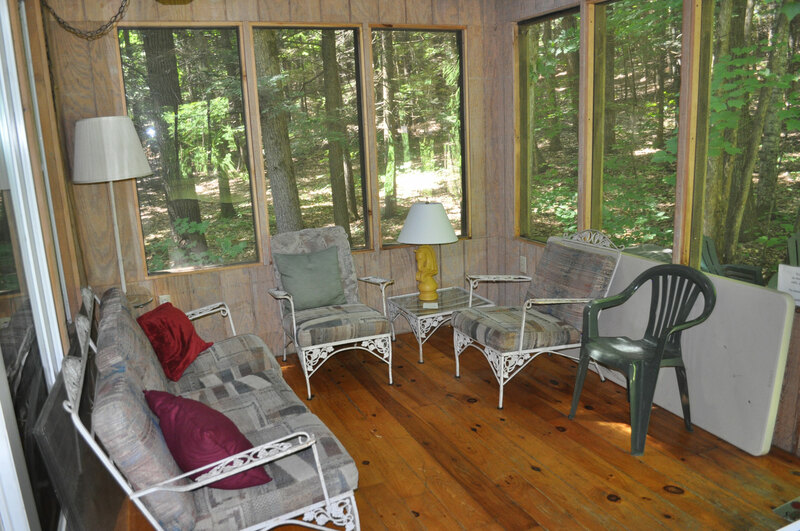 Views from the house are of native Adirondack trees and rock ledges. The house is set back 200 feet from the road (Route 9N, Lake Shore Drive), with no other houses on any side. Capacity The house contains four bedrooms and four full baths and is arranged and furnished for a party of up to ten people. Except in the summer, rates are computed according to the size of the group, from two to ten, and we welcome the small group, too. Wireless Internet connection A wired or wireless Internet connection, a Spectrum product is available in the house at no extra charge. Pets Your pet is allowed to accompany you on your vacation provided permission is obtained ahead of time. A pet fee of $85 for a week or $50 for a weekend will be charged. The town of Bolton does have a leash law, so a dog must be leashed whenever it leaves the property. We give your dog a clean bed, too. Owner living locally The owner lives two miles south of the house year-round and will personally and promptly respond to any questions or problems you have during your stay. Hiking trail A private hiking trail around the 49 acres of woodlands out back guides you along a walk of 1.4 miles one way. It takes you by tall cliffs, rock ledges, a deep gorge, and small streams, and at the trail's end to magnificent views of the lake. 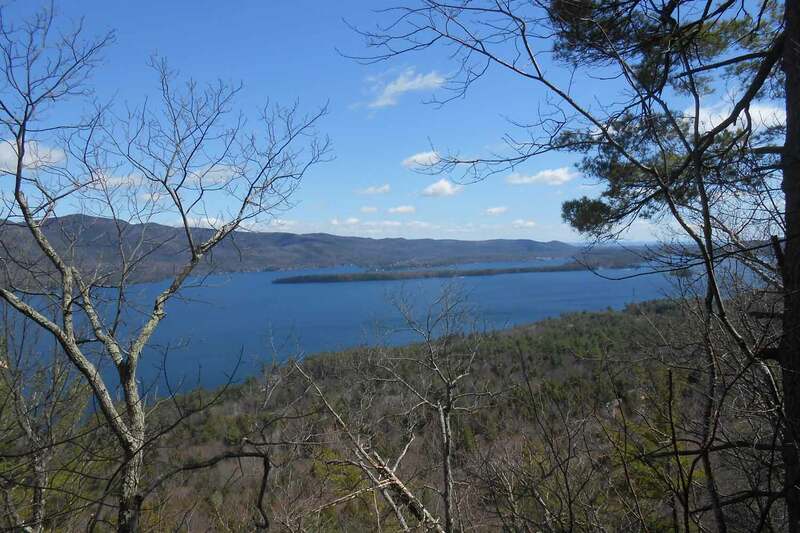 Those include such landmarks as Dome Island, the Narrows, and Tongue Mountain to the north and Long Island, French Mountain, and mountains in Vermont and Massachusetts to the south. Conservation Easement Nature lovers would be interested to know that a conservation easement was recently placed on the property. It will ensure that the property will be preserved in its natural state in perpetuity. Swimming and boating: There are two public beaches 4 miles to the north in Bolton Landing and another two in the Village of Lake George. We supply several beach chairs for your use at the beach. There are several marinas on Lake Shore Drive where guests may rent a boat. At Water's Edge Marina in Bolton Landing, you may rent a dock space for your own boat for $50 a day. (Call now to reserve your space for 2019.) All are within a 10-minute drive. 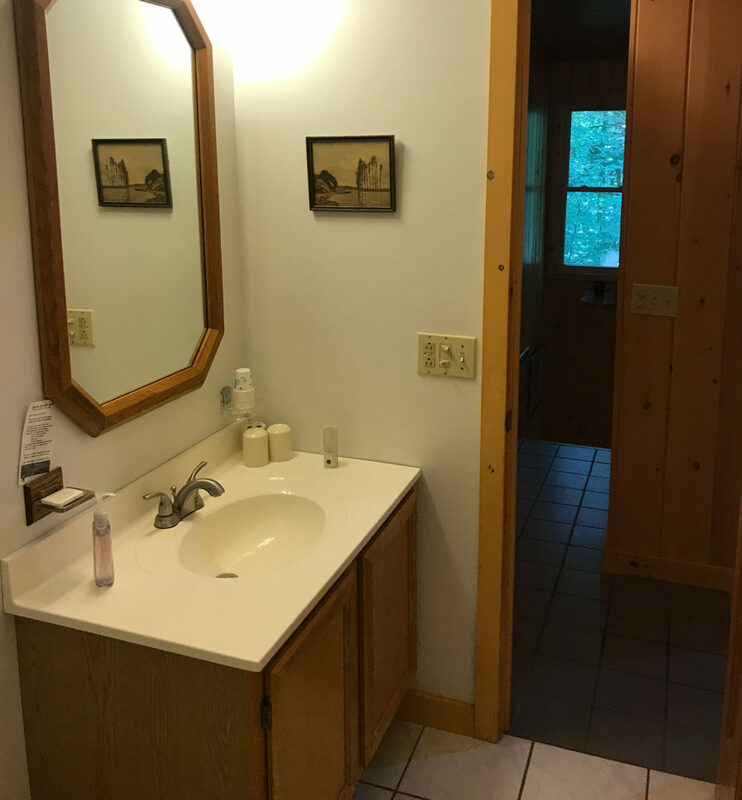 The house itself has no direct lake access. View from the top of our trail. 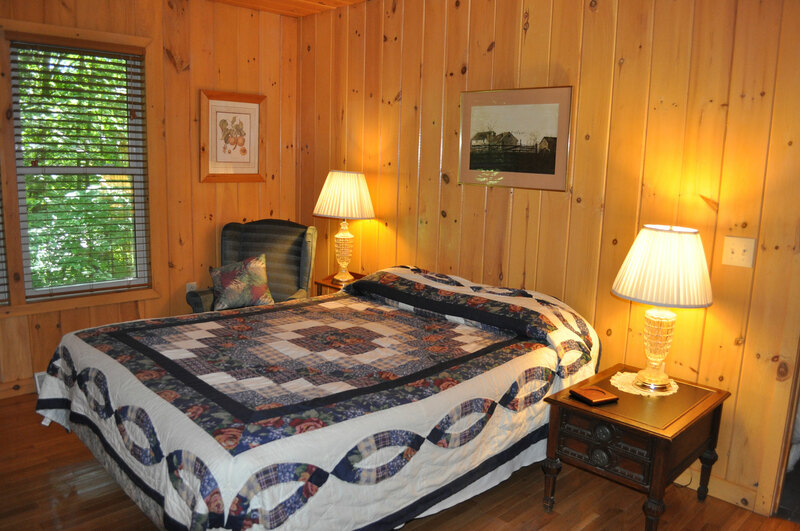 Rooms are large, their walls and ceilings paneled with knotty pine, and the floors made of oak or ceramic tile. Doors are oak as well. Ceilings are high, windows large, and decorations sparse, lending an atmosphere of space and relaxation. Every room looks out over a natural setting of forest and mountains. 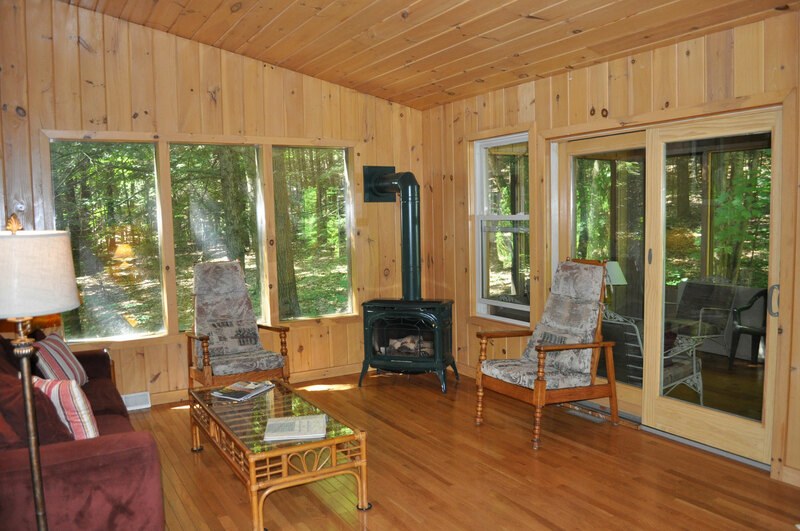 The main room with its knotty-pine vaulted ceiling is quite an exquisite room and large enough for gatherings of the entire group. It contains a large gas-fired woodstove, the living, dining, and kitchen areas, and a table that seats eight or ten comfortably. Here, too, are one of the two TVs (with cable), the CD and DVD players, the radio, and an assortment of books and a small book swap, and games and puzzles for the guests' entertainment. A second TV with DVD player is in the downstairs bedroom where the futon sofa is. 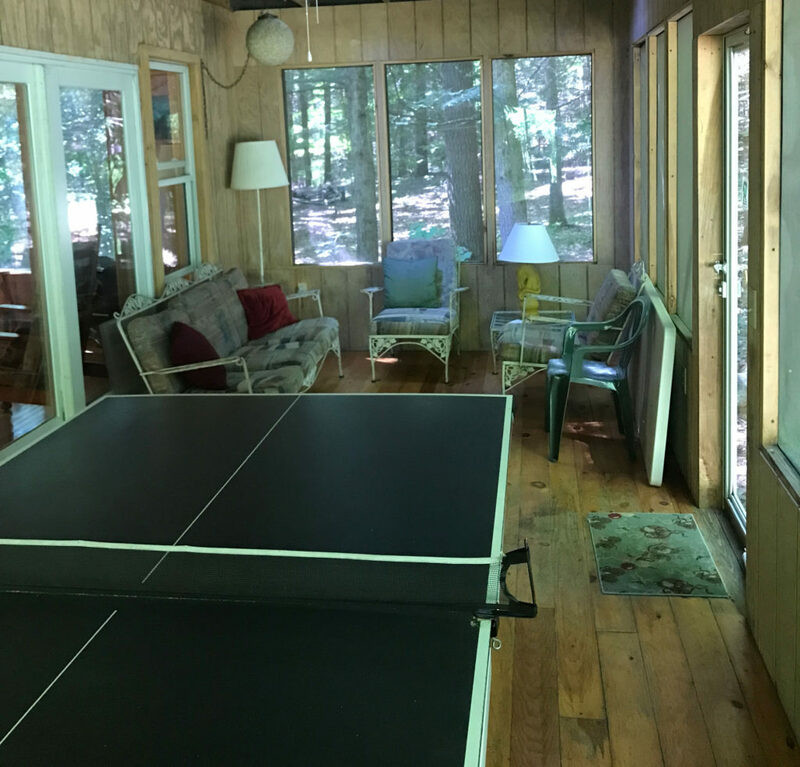 The screened porch now sports a regulation size Ping-Pong table for use by our guests. The paddles and Ping-Pong balls are provided. 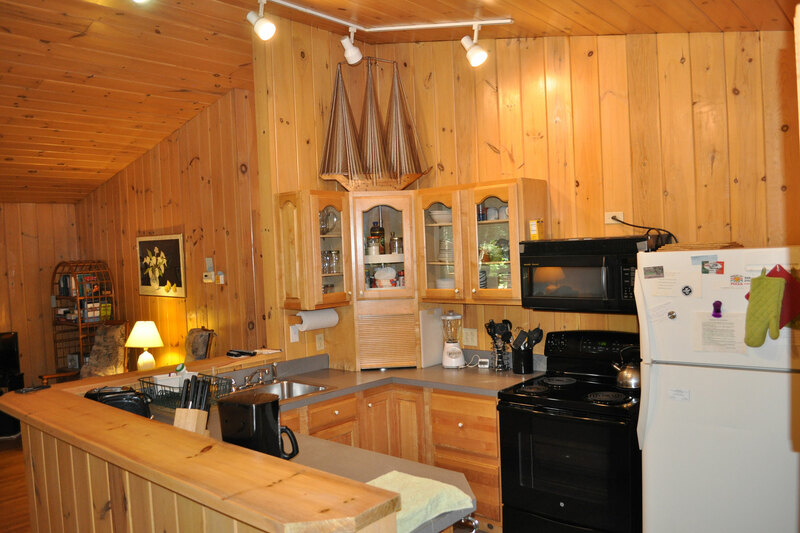 The kitchen is equipped with a four-burner electric stove with oven, a refrigerator, and a dishwasher, as well as two coffee makers, an Oster blender, a hand mixer, an electric grill, and a microwave oven. Pots and pans are abundant; silverware and dinnerware will accommodate a group of ten. A full-size pantry provides generous space for kitchen equipment and your groceries. 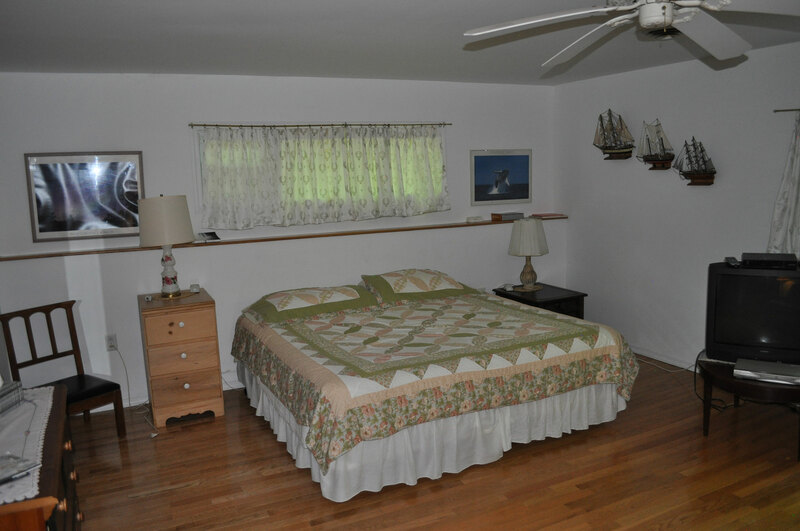 The two upstairs bedrooms are the same size with a queen-size bed, a full bath, and a walk-in closet in each. The third and fourth bedrooms are on the lower level. Each of those contains two single beds, which can be made up as a king. The larger of the two also has a futon sofa and a TV and DVD player. 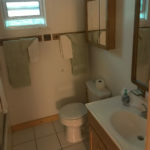 Its bathroom is on the upper level. 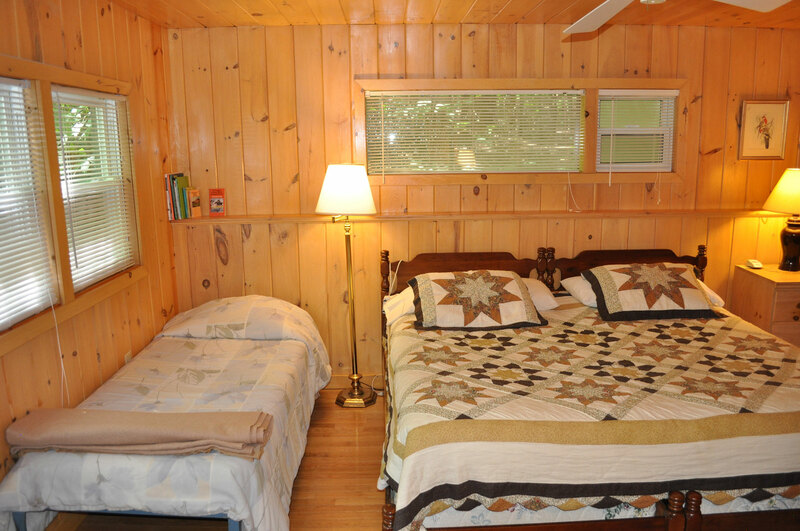 The smaller twin-or-king room also has a narrow single bed and its own bathroom with a large fiberglass shower. Both have a walk-in closet. A highchair, a booster seat, a set of baby gates, and a standard crib (the crib for a $25 fee) are available for small children. 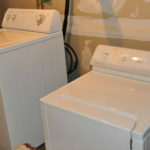 On the lower level are a standard washer and dryer, an iron and ironing board, and a counter for folding. We provide both a washing ball, which makes heated water and detergent unnecessary and some fragrance-free cold-water detergent in cast you prefer that. In the laundry room is also the recycling station, with bins for sorting your bottles, cans, and paper products. 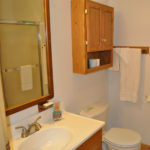 Three baths have a shower and tub combination and counter space around the basin. 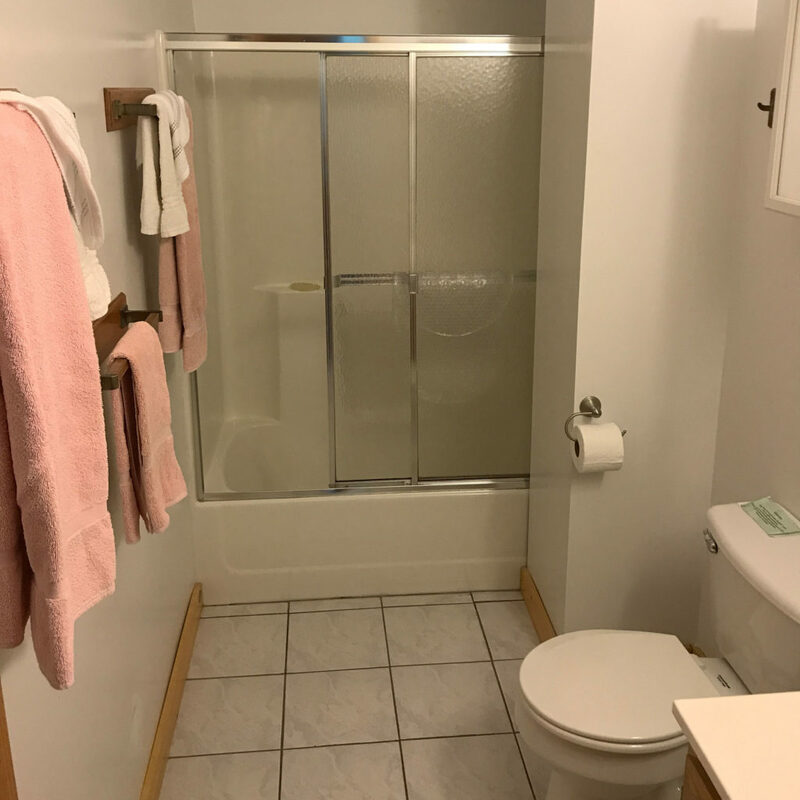 The fourth bathroom has a large fiberglass shower. 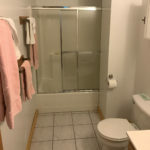 All bed linens are furnished, as are a bath towel and washcloth for each guest (plus a lot of spares), bath mats, and dish towels. We do not provide beach towels. 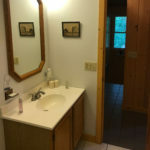 Cell phone service is spotty in the Lake George Basin, but, except for Verizon customers, guests of Woodland House do have good or at least adequate service. Even Verizon customers can send and receive texts. The grounds The grounds are heavily wooded and contain a small stream, an outcropping of rock ledges, and many species of native trees, including white pine, beech, hemlock, oak, maple, birch, hickory, and aspen. They provide shade, privacy, and natural beauty to the grounds. A modern gas grill with a spare canister of propane is provided for outdoor cooking. 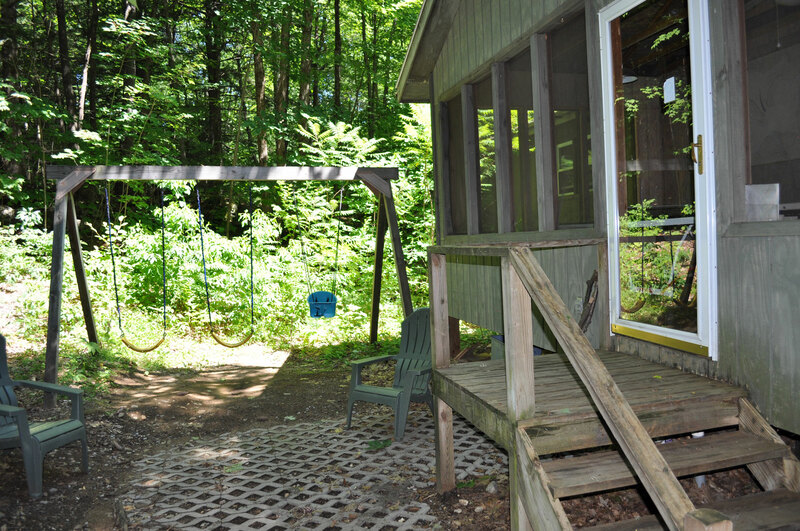 A set of swings including a baby swing is also available outside the screened porch. A portable fire pit is available for small outdoor campfires - provided weather conditions are such that outdoor fires are not a hazard. Guests will need to get our pointers on the safe use of the fire pit. 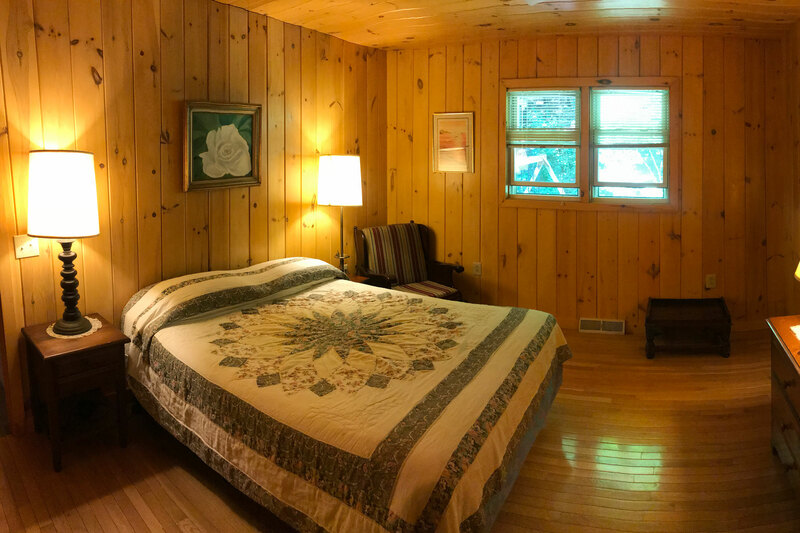 If a power outage occurs during your stay, a 6,800-watt generator will be provided to supply the house with use of the furnace, water, septic system, refrigeration, and a number of electrical outlets.